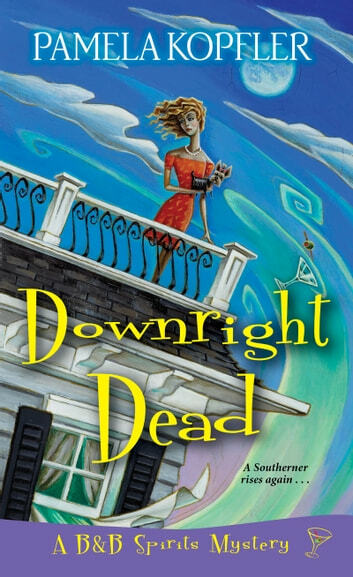 Holly Davis never imagined having a haunted bed and breakfast would be the secret to her success—or that a secret might leave her B&B DOA . . .
After the syndicated TV show Inquiring Minds airs footage of their resident ghost at Holly Grove, a converted antebellum plantation house, it seems as if half the state of Louisiana wants to book a room. There’s only one small problem: the ghost of her not-so-dearly-departed husband Burl has . . . departed. For the sake of business, Holly’s willing to keep up the pretense of still being haunted. But after an outspoken debunker challenges the show’s credibility, the TV crew returns to Holly Grove to prove the ghost is real. Following a disastrous séance, Holly is sure she’ll be exposed as a charlatan. Surprisingly, the debunker suddenly becomes a believer—after he’s pushed off the widow’s walk to his death and rises as a ghost. Now his inquiring mind wants to know: who murdered him? When he asks for Holly’s help, she can’t say no. But this time it’s her turn to watch her step, because if the killer gets spooked, the next ghost haunting the B&B may well be its owner . . . This book is the second in the series, and I think a very worthy addition. As was the first one, this one was fun, well-written, and a good who-done-it. Oddly enough, I think Nelda is my favorite character over the main character Holly. Not that I don’t like Holly, because I really do, but at times I do find her a bit…hmm, I’m not sure. Flighty maybe. That aside, I really did enjoy this latest addition to the series, and the end surprise really threw me in a good way! I’m hoping that in the next book we explore that surprise. And, to be honest, I hope we get to see what the moving pictures were all about, and we have another great big ghostly mystery! If you like light paranormal cozies, you need to give this great book (and series) a try! Highly recommend! I received a complimentary copy which I voluntarily reviewed. Inquiring Minds filmed the story of the ghost of Holly's ex husband, Burl, who was haunting the family B&B, Holly Grove, and now they are back and ready to prove a ghost debunker that ghosts really do exist. Just one problem...Burl crossed over after the show was filmed. Holly doesn't want that to get out as she is counting on the story of the haunting to drive business to her B&B. There's not much Holly can do short of faking it like the debunker already claims they are. Her family's business is at stake. But when the debunker is murdered, who had both means and motive to shut down the story once and for all? This is a fun Southern mystery and I truly enjoy this well written series!